NAM, alongside a large number of HIV organisations and many community activists, are agreed that a 10,000 place PrEP trial was never large enough to meet demand. For this reason, alongside 31 other organisations, we are calling on NHS England and local authorities to ensure the routine availability of pre-exposure prophylaxis (PrEP) on the NHS in England by 1 April 2019. That’s why we’ve released a joint community statement, We need PrEP on the NHS now. The current three-year PrEP IMPACT trial isn’t fit for purpose. The trial is capped at 10,000 places and within just eight months over 7000 of these are taken. A survey of PrEP users, taken before the trial opened, indicated that the demand would outstrip the limited number of places. Many participating clinics are now closed to gay and bisexual men, which means people are being turned away from clinics who are in need of PrEP – some of whom have contracted HIV as a result. PrEP is almost 100% effective when taken as prescribed. It’s cost effective when measured against the cost of lifelong HIV treatment and care. PrEP has the power to stop many people from becoming HIV positive. NHS England and local authority commissioners must start the process now to ensure PrEP is routinely available in sexual health clinics by 1 April 2019 at the latest. 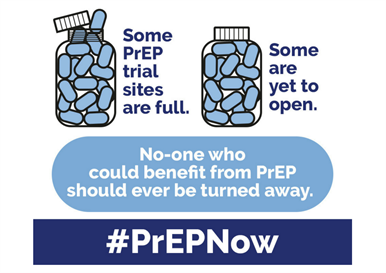 We believe the PrEP IMPACT trial should continue alongside routine commissioning. Read the full community statement and show your support on social media using the hashtag #PrEPNow.